Speaker, author and consultant, Daniel Lerner, is positively revolutionizing the way we achieve excellence both at work and at home. How do we realize our utmost potential at work, at home, and in life? By integrating the cutting-edge sciences of emotion, engagement, passion, willpower, choice, character strengths, mindsets, and others, Dan shows you how to create a life of well-being and excellence—helping you become who you’re capable of becoming. Compelling and engaging, Dan delivers his profoundly thoughtful and uplifting messages to students, established and high-potential performing artists, athletes, and prestigious institutions ranging from jet.com, to Walmart, to IBM, to international government conferences. Ready to strive for excellence? Click to receive a free sample chapter from Dan’s latest book. Integrating core principles of positive and performance psychologies, Dan’s methodologies leverage the advantage that a healthy psychological state brings to each individual’s potential for peak performance. With a Masters in Applied Positive Psychology from U Penn, Dan engenders the pursuit of passion and positive excellence to the individuals and businesses he coaches, and to the many students he teaches at NYU. Dan loves helping others grow and reach their full potential, while applying the best scientific research on the subject to date. 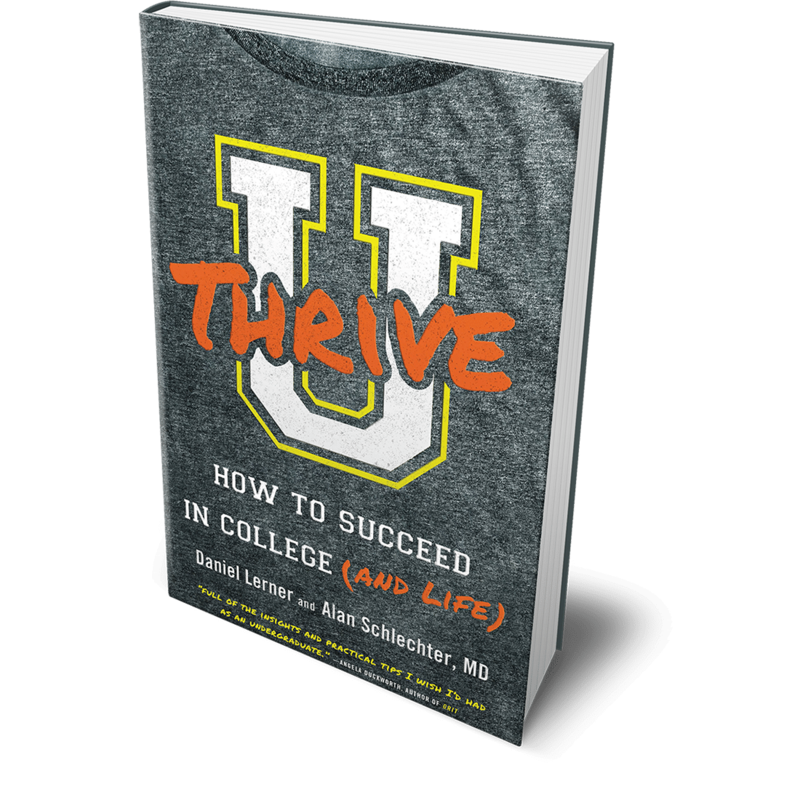 Based on the most popular elective course at New York University, Dan’s new book “U Thrive: How to Succeed in College (and Life),” is a bold mix of fascinating science, real-life stories and tips for building positive lifelong habits that help students grow into the happy, successful alums they all deserve to be. He has a rich background on so many topics, but what I love about Dan is how he delivers his sessions. They are full of real life scenarios, current research and funny stories. I am not surprised his class at NYU, ‘The Science of Happiness’ is one of the most popular on campus! When you see Dan teach, you immediately sense his intelligence, intellectually AND emotionally. He has worked with corporate executives, elite musicians, and athletes on how to enhance their performance and use positive psychology to build and sustain success. Dan knows how to help people move toward excellence. Daniel takes the stage with an optimism and passion that is evident in both his subject area and personality. His presentation was ranked the highest by far from our participants, and the rave reviews I received afterwards about him were endless. By not only explaining the psychology, but also posing thought-provoking questions, Daniel made sure the speech was interactive and reflective rather than simply passive. We have asked Daniel to come back to our next retreat as a featured speaker, and I hope we can continue to welcome him there! Dan is electric! When he speaks, people tune in like the world is on pause. In the 10 years that I have known Dan he has done speaking engagements for my wealth management practice, to clients and referral sources, and for my alumni association (University of Maryland). The responses that I receive after each and every event are beyond positive … they are uniquely exceptional.